The world's fastest electric skateboard ever! 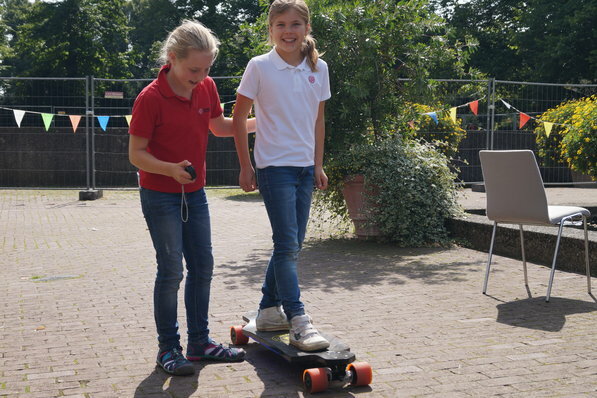 With 34 MPH (54 KMH) it is way faster as all other boards that you can order! With 8000 watts of power it has an amazing acceleration. 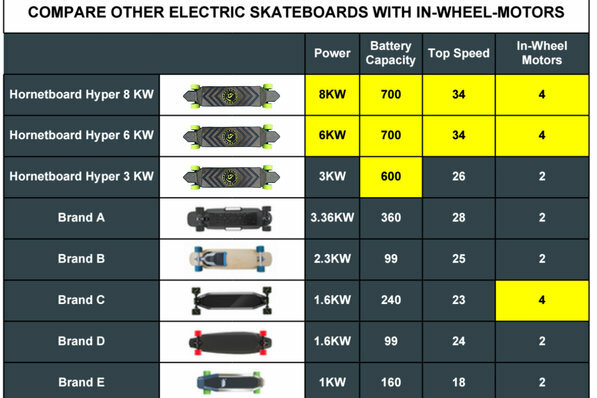 That is more than 10 times stronger as a normal electric skateboard! You will stand on a real rocket! 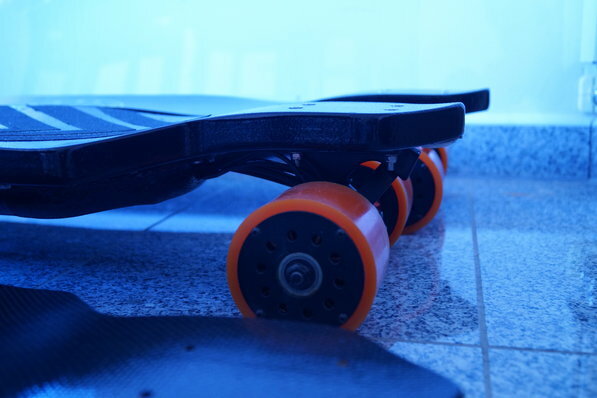 In few seconds you get the speed of 34 MPH (54 KMH) - it is a phenomenal speed on a board! All technical equipment is build in a thinn Board so you have a smooth stealthy design without any big boxes under the board. The motors are completely in the wheels mounted! Das Geld wird für die Bestellung der Mindestbestellmenge von 100 Stück benötigt. All other electric skateboards that are on the market are not able to climb a hill without getting over temperature with me. My weight is 240 pound - so that is the problem - no other electric board can carry so much. They are too powerless to transport me uphill. 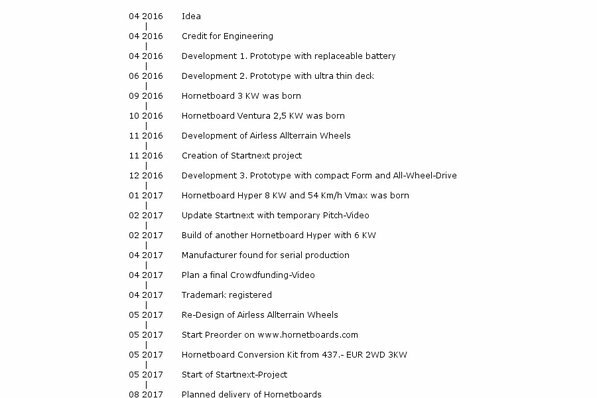 So i decided to build my own electric skateboard with much more power - so much that the motors and controllers did not get too hot and turn off. Please help me to make this powerful electric board effordable to other heavy people like me. At the Moment the production costs and parts are expensive in single production. Let's make the costs less with mass production! The more people support me the more effordable is the price to you for these Boards. If this project will be successful - you get a real powerfull rocket board for less money. Save up to 40 % off the retail price with your support! You will get the first limited edition of Hornetboard Hyper before everyone else! With this I will order parts and materials for your Rewards and the Hornetboard Hyper Boards in different Power stages. This is a real innovation in the electric skateboard sector: A airless offroad tire! It absorbes shocks from the underground and run without air. You may know it from military cars. With this package you have 1 year full service (only your shipping costs to germany must be paid). This includes not willful destruction or improper handling! With this package you have 2 years full service (only your shipping costs to germany must be paid). With this package you have 3 years full service (only your shipping costs to germany must be paid). Hornetboard Hyper 3 KW - Save 40 % of the retail price! - Display in the remote for the battery and motor temp. Hornetboard Hyper 6 KW - Save 40 % of the retail price! One Special-Edition in limited Edition of a Hornetboard variant. For the special design and the additional revenue thus gained, I will hire a designer who bring a super cool design of this limited edition. Be surprised!